GUIDE: Batteries in a portable world. 1. When was the battery invented? 1. When was the battery invented? One of the most remarkable and novel discoveries in the last 400 years has been electricity. One may ask, “Has electricity been around that long?” The answer is yes, and perhaps much longer. But the practical use of electricity has only been at our disposal since the mid-to late 1800s, and in a limited way at first. At the world exposition in Paris in 1900, for example, one of the main attractions was an electrically lit bridge over the river Seine. The earliest method of generating electricity occurred by creating a static charge. In 1660, Otto von Guericke constructed the first electrical machine that consisted of a large sulphur globe which, when rubbed and turned, attracted feathers and small pieces of paper. Guericke was able to prove that the sparks generated were truly electrical. The first suggested use of static electricity was the so-called “electric pistol”. Invented by Alessandro Volta (1745-1827), an electrical wire was placed in a jar filled with methane gas. By sending an electrical spark through the wire, the jar would explode. Volta then thought of using this invention to provide long distance communications, albeit only addressing one Boolean bit. An iron wire supported by wooden poles was to be strung from Como to Milan, Italy. At the receiving end, the wire would terminate in a jar filled with methane gas. On command, an electrical spark is sent by wire that would detonate the electric pistol to signal a coded event. This communications link was never built. 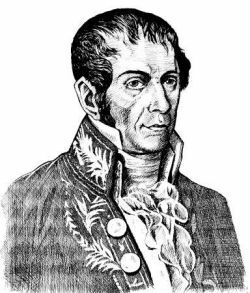 Figure 1-1: Alessandro Volta, inventor of the electric battery. Volta’s discovery of the decomposition of water by an electrical current laid the foundation of electrochemistry. ©Cadex Electronics Inc. In 1791, while working at Bologna University, Luigi Galvani discovered that the muscle of a frog contracted when touched by a metallic object. This phenomenon became known as animal electricity — a misnomer, as the theory was later disproven. Prompted by these experiments, Volta initiated a series of experiments using zinc, lead, tin or iron as positive plates. Copper, silver, gold or graphite were used as negative plates. Volta discovered in 1800 that a continuous flow of electrical force was generated when using certain fluids as conductors to promote a chemical reaction between the metals or electrodes. This led to the invention of the first voltaic cell, better know as the battery. 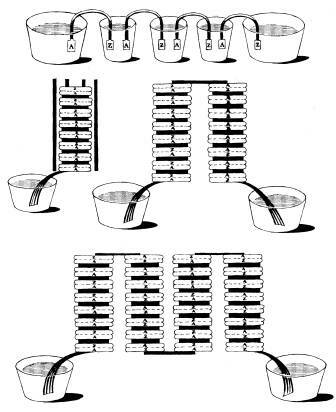 Volta discovered further that the voltage would increase when voltaic cells were stacked on top of each other. Figure 1-2: Four variations of Volta’s electric battery. Silver and zinc disks are separated with moist paper. ©Cadex Electronics Inc.